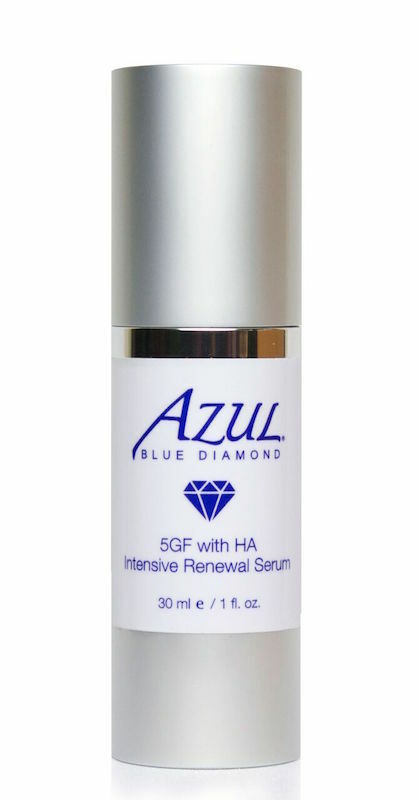 Azul’s Intensive Renewal Serum contains growth factors and peptides engineered using biotechnology methods (so they are clean and not taken from human cells) and backed by extensive clinical studies. It contains five growth factors and many peptides, amino acids and vitamins. These deliver numerous powerful skin benefits. In addition, the base of the serum is sodium hyaluronate, which plumps skin, has an elegant feel, and dries quickly. This serum can be used on its own, in conjunction with microneedling, or as an added boost or treatment with any cleanser, toner, or mask. Apply morning and night, massage into clean skin. Growth factors in this product accelerate skin and wound healing, increase rate of skin renewal, slow thinning of aging skin, promote skin rejuvenation by reducing wrinkles, boosting collagen and elastin synthesis. Sodium hyaluronate is absorbed into the skin, and can retain up to 1000 times its own weigh in water. Which means, when applied topically it can get deep into the skin, and either to combine with or attract water, resulting in plumping of the tissues. This serum should be applied to clean skin after you cleanse and/or tone your face. If you want to apply moisturizer or any other serum, do so after using the Intensive Renewal Serum. It will dry quickly, so you won’t have to wait long to apply additional products.